"Since the beginning of the motion picture, the newsreel has been recognized as a vital medium of public information. Movie goers demand it. But, by the very nature of its technique and the swiftness with which it brings today's events to the screen, the newsreel can give little more than headline news. And so it has created among movie-goers a desire to see more." 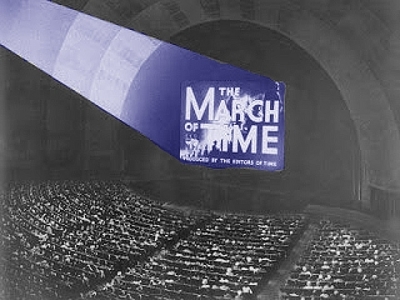 "It was this desire 'to see more' that led the founders of 'The March of Time' to launch their new kind of pictorial journalism...The first issue appeared in some 400 theaters throughout the United States on February 1, 1935"
Click here to read another article about 1930s newsreels.